If you don’t have an outdoor space, or would like to compost all winter long, an indoor compost bin is the way to go. A time-tested approach to indoor compost is a vermiculture system (AKA worm bin). Eisenia fetida commonly known as Red Wigglers. 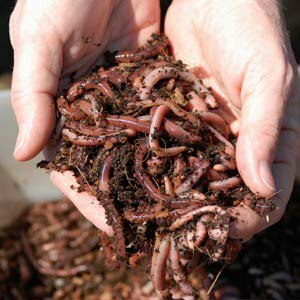 We are different from common earthworms, mainly because we are surface dwellers… which is perfect for compost! Our main job is to eat, poop, and make worm babies. Our poop is pretty special though (if we do say so ourselves). It is the “black gold” that fertilizes organic farms, livens up your house plants, and makes perfect potting soil. We complete the circle of sustainability by eating your garbage and turning it into something that helps your food grow. You’re welcome. spicy and/or waxy vegetables like green pepper, jalapenos, etc. excessive amounts of coffee grounds are not healthy. Use in moderation! Some of these items are ideal for an outdoor compost bin, but we are slightly more delicate! Shred newspaper into 1/4 to 1/2“ strips and lay on the bottom of the bin to form a bedding layer. Spray the paper with water until damp. The paper should only be as wet as a wrung out sponge and there should not be any liquid on the bottom of the bin. Feed worms no more than 1 lb. food waste, per day, per 1 lb. worms, making sure that there is always a layer of damp newspaper covering food and worms (keeps flies away). 3. Worms are dying: Bin too dry, food and bedding eaten, extreme temperatures. Solution: keep materials in bin as moist as a wrung out sponge. When all food and bedding is eaten, harvest compost. Keep in a cool dark place between 55 and 77 deg. 4. Rodents: Overfeeding, holes in bin too large. 5. Sow bugs/beetles in bin: No problem! They are good for the bin! For those of you who learn better through pictures and diagrams, Sustainable America has a great infographic on indoor composting here. Still having problems? If you’ve got a problem, yo, I’ll solve it.